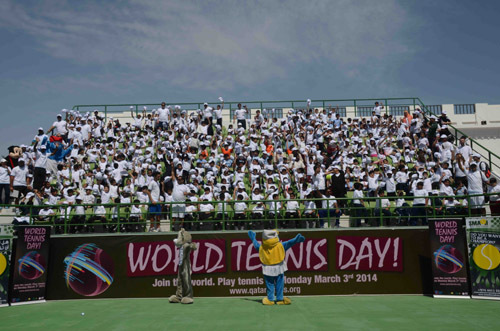 Yesterday marked the second annual World Tennis Day. The International Tennis Federation initiative seeks to grow and enhance tennis programs at all levels of participation. From New York to London to Hong Kong, events were held throughout the globe with professional players, celebrities and fans all taking part. The Khalifa International Tennis and Squash Federation hosted various activities on the day to highlight the importance of tennis in the country as itcontinues to grow. The morning showcased young talent as the Schools Olympic Program boys’ under-8 and under-10 divisions took to the courts while simultaneously there was a schools festival being held. The afternoon saw a corporate competition with participants from ExxonMobil, Total, Ooredoo, 51 East, Aspetar and Alfardan Automobiles. Oliver Girard, representing Aspetar, defeated ExxonMobil’s MazineKessaissia in the final. Tennis 10s held a festival and a competition for boys and girls in the evening. The weeklong Qatar Asian Juniors Under 14 tournament was also played during this time. With the success of the events in Qatar, there is no doubt that tennis is a growing and thriving sport in the desert.